The mast and mainstay . . . . 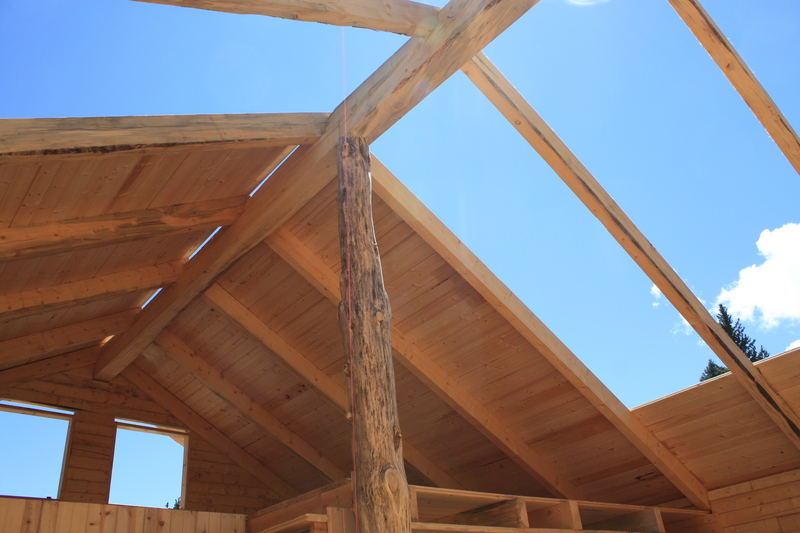 This center pole is a Big Horn spruce and rises from the roof down to the main floor of the new cabin. 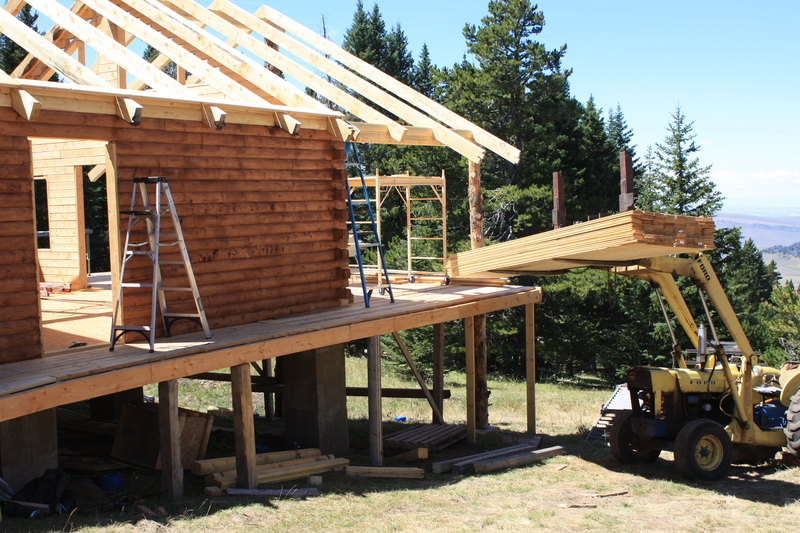 Dudley (my brother, who has been tagged with that name since Rocky and Bullwinkle days when we were kids) is pouring his soul and spare cash into building this wonderful retreat on the divide of the Big Horns. The loft, where short people sleep . . . . When I say “short people,” it includes people of normal height, which does not include Dudley, who is 6 ft. 5 inches tall. Ranger ramp? . . . . Doubt the Ranger will be able to drive up this ramp to unload groceries, but it still makes an easy walk from the parking lot into the cabin. 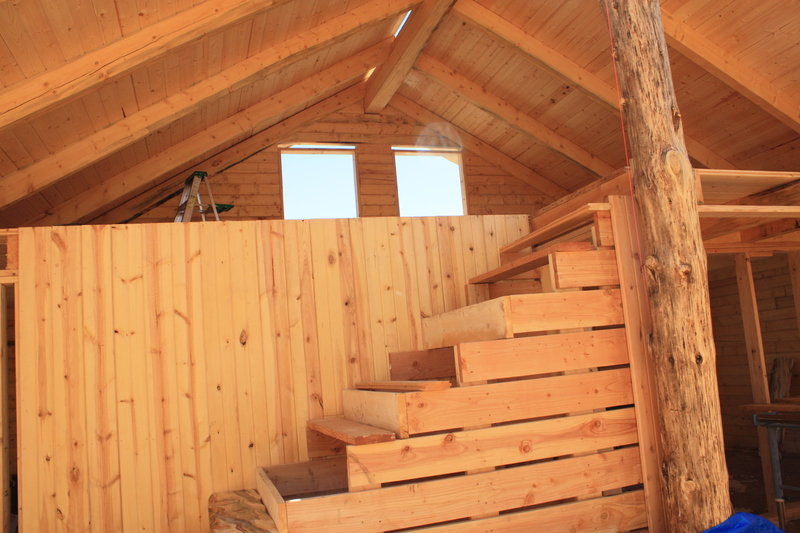 A stairway is planned going down the other side of the deck. 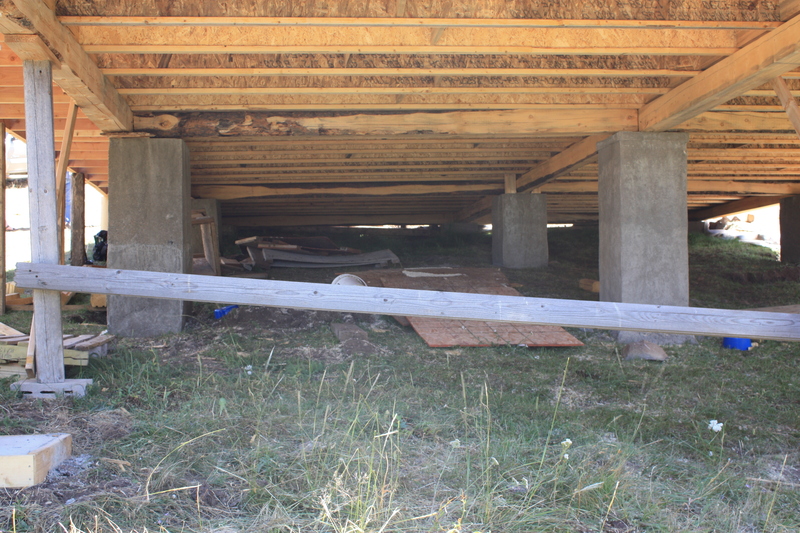 Structural supports should make for a good dance floor! . . . . I doubt there will be a “load factor” for structure. Even though we have all put on a few pounds, we shouldn’t rock the boat. 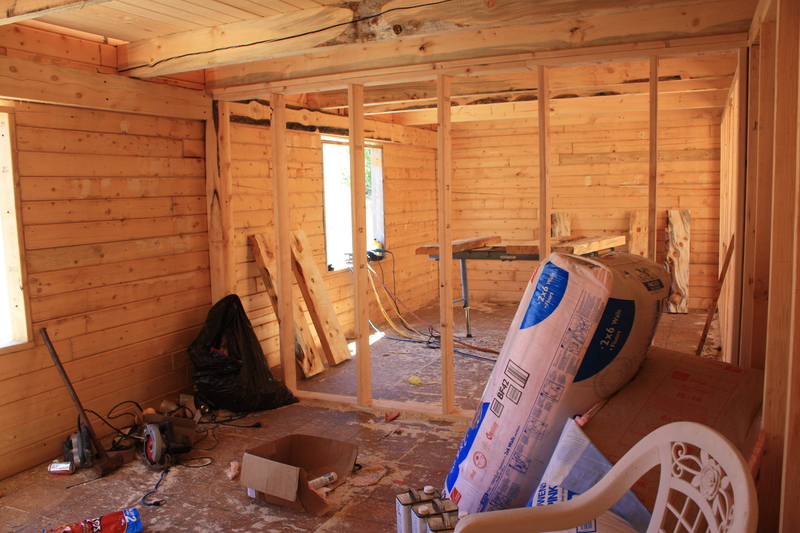 Imagine two bedrooms . . . . These are sizable rooms, and when you add in the loft, should afford sleeping for at least a couple dozen (just kidding, Dudley)! Curbside critics . . . .
Big John Moses, in the grey hoodie, is the master builder and all agree it is a fine job. The great basin . . . .
A bit hazy on the day this was shot, but the Big Horn basin rolls out to the west and makes for great viewing from the deck. Uh oh, water in the hole . . . . 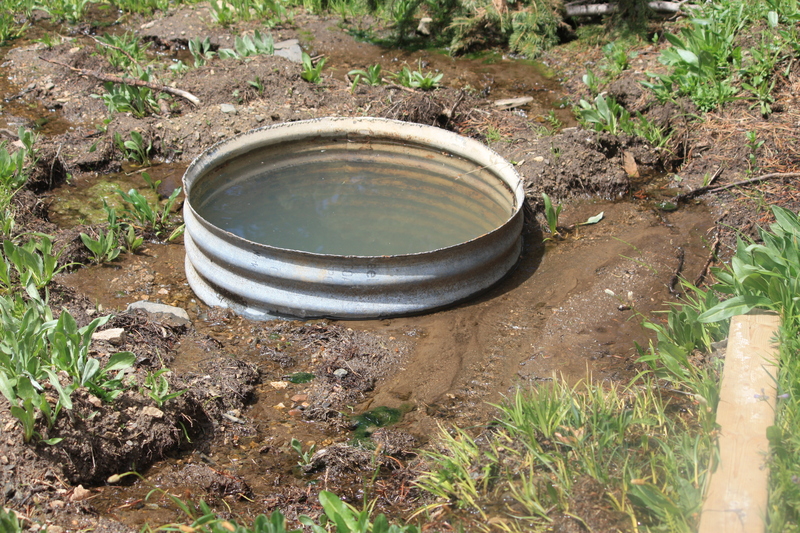 This culvert is deep and was planned to be where the outhouse would sit. Trouble is, this spring when it was time to move, it was full of water. What to do? 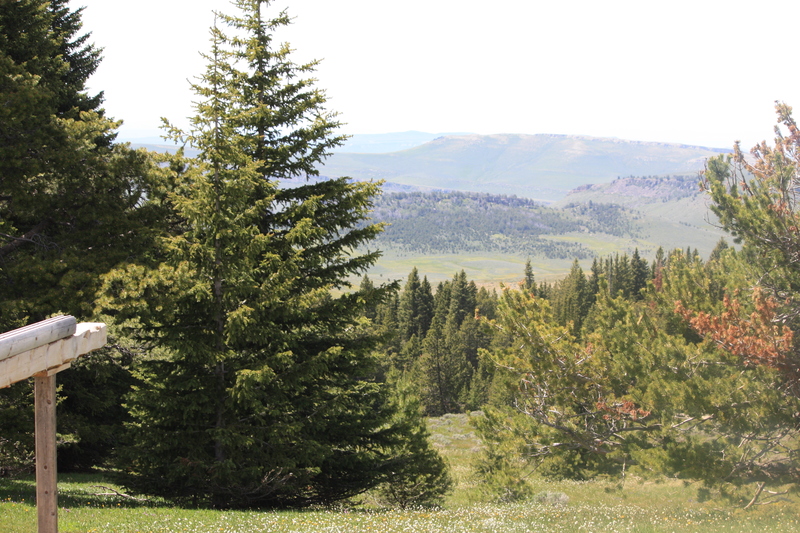 Guess Dudley will have the only flush toilet on the SEBH (South End of Big Horns). 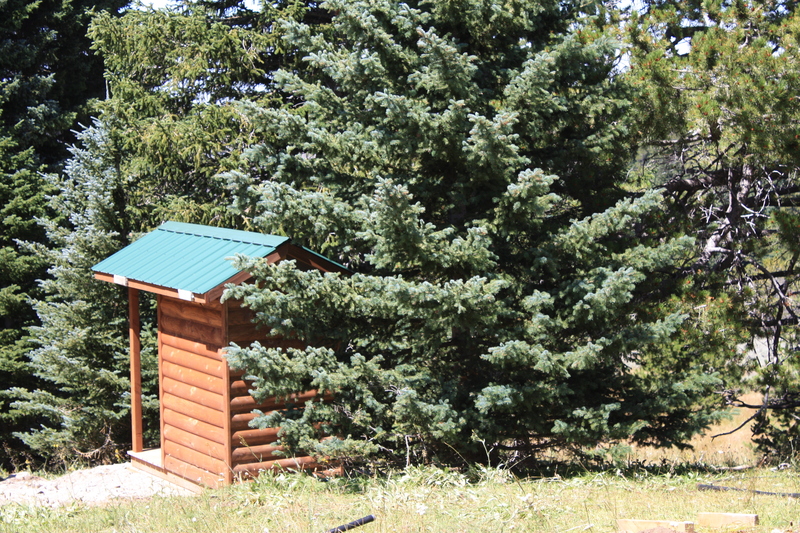 The little house in the pines . . . . Neighbor Tom’s ingenious outhouse is finally on solid ground and over the culvert that was pumped and filled with a few sacks of concrete to stem the tide of water flowing into it. Oh well, we don’t really need a flush toilet! 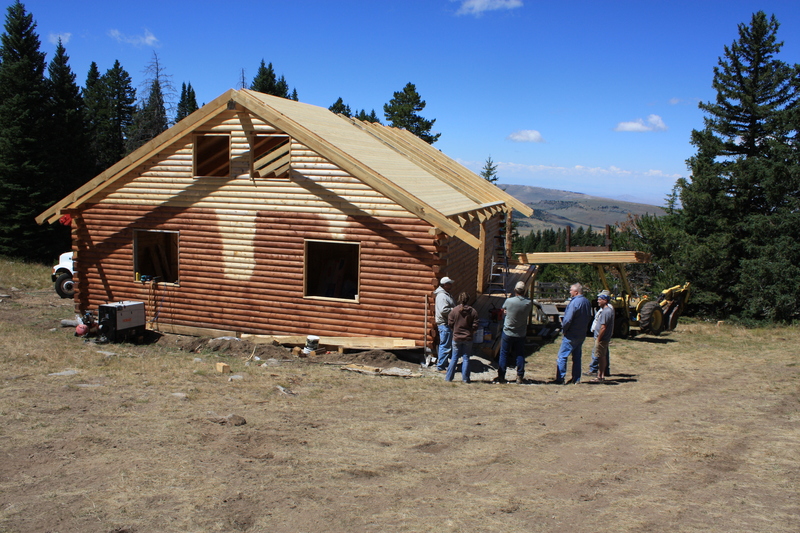 A gathering is planned before snow flies and by then the roof and windows will be installed and the cabin will be 95% complete. Dudley has three sisters who will have all kinds of ideas for the fun part – decorating! This entry was posted in Wonders and tagged mountain cabin holiday by bygeorge. Bookmark the permalink.